So today, I’m going to walk you through how to use Facebook live as a tool to connect with your fans, grow your fanbase, promote your music, and make some income. One of the most natural options for musicians is to simply do intimate performances with just you, your instrument, and your phone. This is a great option for singer-songwriters, but it can work for bands as well – take turns giving each member a chance to do a solo live. Next, you can turn your band’s jams or rehearsals into a Facebook live video. This gives fans a little look into what goes on behind the scenes in band life. 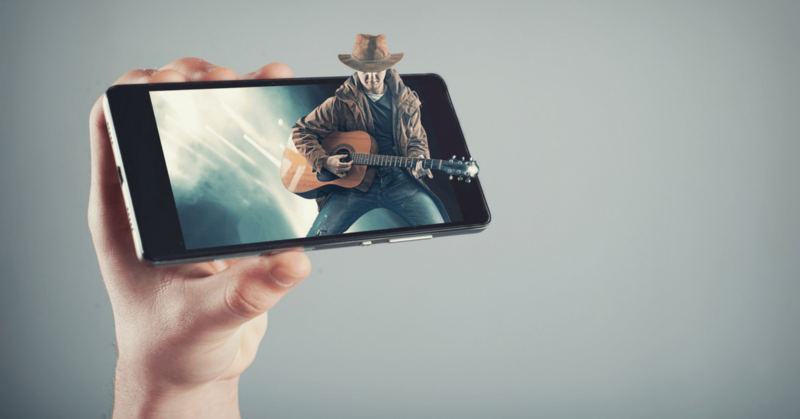 Plus it doesn’t take much effort on your part – you’re already rehearsing, so why not just set up a phone and stream it? These are a little less personal than the one-on-one concerts we talked about earlier, but you can still take breaks and chat with your fans from time to time. This is probably the least personable option. I’d recommend only streaming gigs from time to time – you want fans to actually come out to gigs, not just watch them on their phones, right? With these lives, its best to recruit a friend to be your live camera-man instead of just setting your phone up on a tripod. This can make the experience more engaging and interactive. If you want more ideas of how to use your Facebook live videos to drive music sales, make sure you check out this article next. Facebook Live (or any form of live video) could be a great tool to incorporate into your social media plan. If you’ve never tried a live before, give it a shot this week and see how it goes! It will probably take some tweaking to find a live format that works for you, your schedule, and your fans, but with all the popularity of live video these days, it’s worth giving it a shot. Let me know what you think – have you tried live videos on Facebook or any other platform? What kind of response did you get from your fans? Do you think it’s something that you’ll incorporate into your career?